The Australian Small Business Blog: Are Timewasters wasting your time and costing you money? Are Timewasters wasting your time and costing you money? In too many small businesses, owners work longer hours, often taking home less pay than their employees. They are in fact the last to be paid. In any business we see them, the timewasters. Of course you can never be sure which enquiry is a waste of your time, and which could be a buried gold nugget. And of course, you don’t want to be rude, because even timewasters may seek to damage your reputation if not handled the right way. I recently had such a situation, with a surprising result. This particular enquiry was one of those you look at and think: “Am I wasting my time here?” It was a bit marginal. They had sent some of the right signals, so I offered them an initial free consultation. However, as part of my standard sales process, I asked them some probing questions to see if they were serious, appreciated the value of my time, and be prepared to make a commitment, one way or another at the end of the appointment, rather than say, “I need to think about it”. We all know what that means, and they were insistent they saw that as the only outcome of the meeting. and you swiftly moved us along. We need to take your exact approach to time wasters who walk through our door. While I didn’t receive business from this couple, do you think that they would still speak positively to others about me, and potentially, when they were ready, come back to me and make a commitment not to waste my time? It’s essential that you have a fully defined sales pipeline, in which you have already determined how you will handle different outcomes so you are not left floundering about what to say and do next, including, of course, how to handle timewasters. 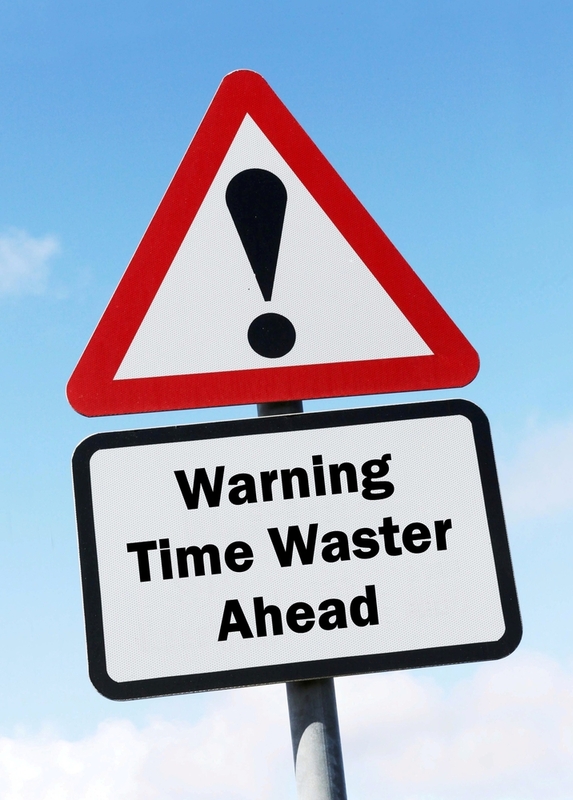 Share this article:Are Timewasters wasting your time and costing you money?